Happy Mardi Gras! 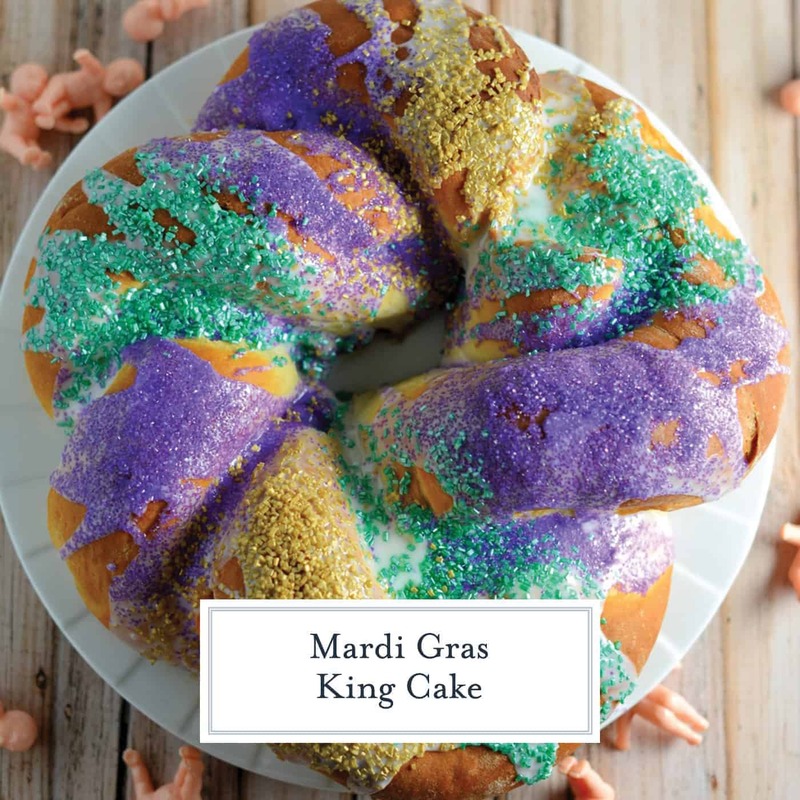 No carnival celebration is complete without a big bowl of New Orleans Gumbo and a colorful King Cake! 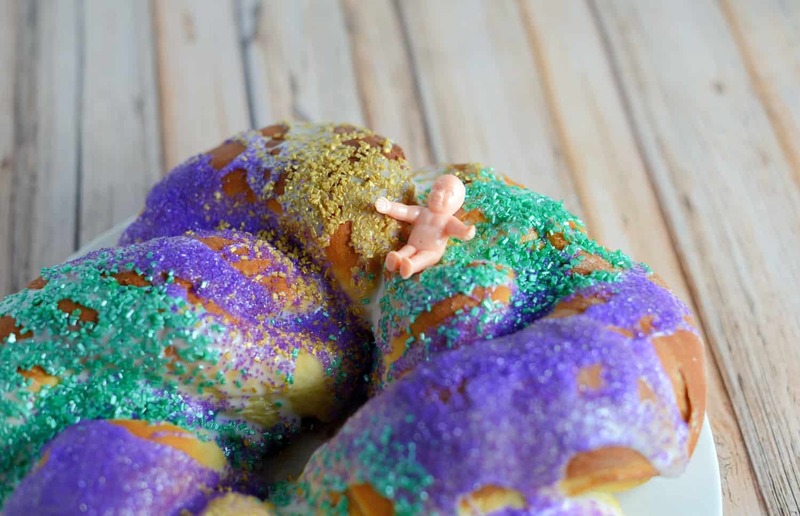 Make your own braided King Cake for Mardi Gras, complete with brown sugar pecan filling, icing, festive colors and one plastic baby. 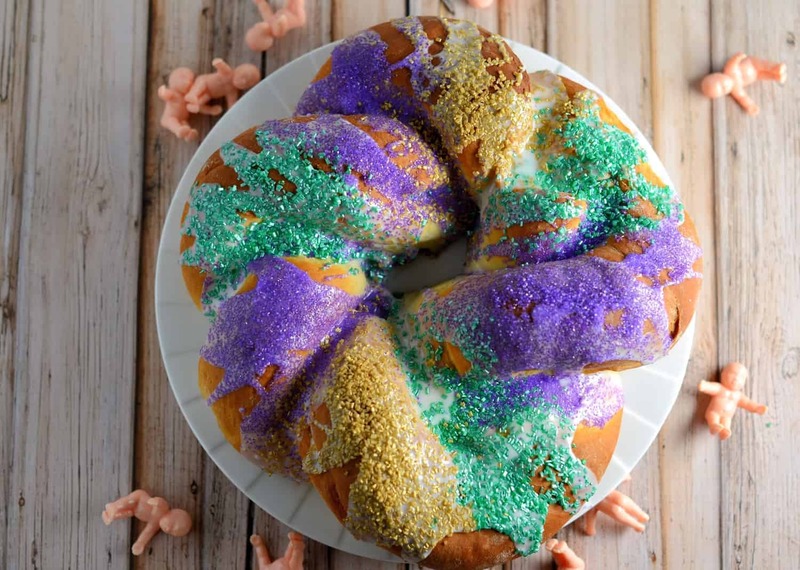 King Cake is a traditional Mardi Gras sweet bread that symbolizes a crown, specifically one that the three kings who visited Christ on the day of his birth wore. Sparkling sugar colors represent purple for justice, green for faith and gold for power and prosperity. , baby Jesus, is inserted into each cake after baking. The individual who gets the slice with the baby will have good fortune for the upcoming year. They are also obliged to host the next year’s King Cake party. However, if you are slicing and happen to slice that poor little plastic baby, you will have bad luck for the upcoming year. 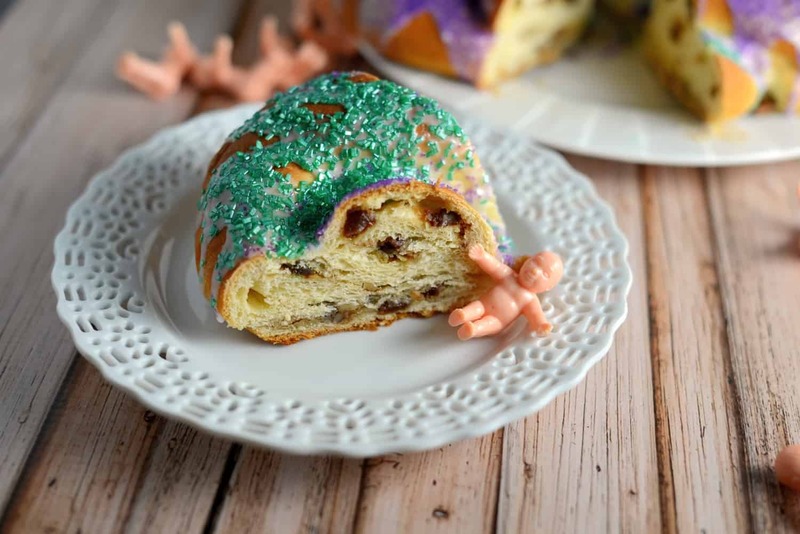 Although King Cake is called “cake” is more of a cross between a Danish pastry and French brioche. The sweet and buttery bread is stuffed with a raisin, brown sugar and pecan filling and then topped with a powdered sugar glaze and bright sparkling sugar. 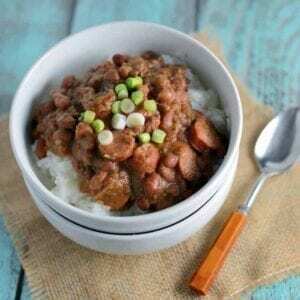 To learn more about Mardi Gras, visit my post about Red Beans and Rice and enjoy the holiday!! 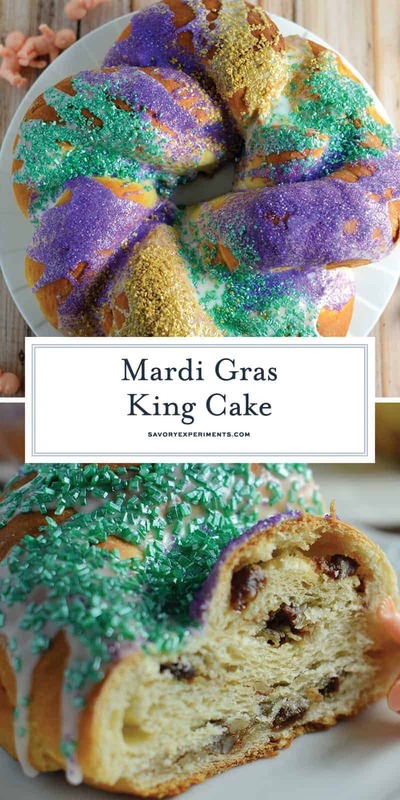 Mardi Gras King Cake Recipe - A giant sweet roll stuffed with brown sugar, raisins and pecans and decorated with icing and purple, green and gold sparkling sugar. 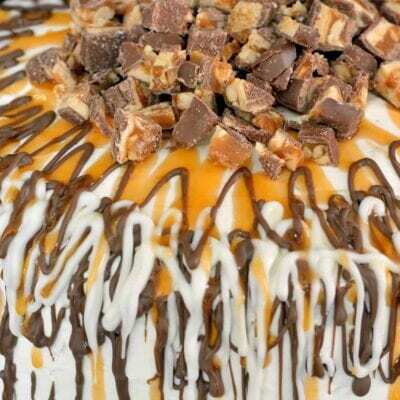 Perfect for breakfast or dessert during carnival or on Fat Tuesday! In a large mixing bowl or bowl of a stand mixer fitted with a which attachment, combine 1 package of dry active yeast, 1 tablespoon of sugar and warm water. Take care that water is not too hot or it will kill the yeast and prevent it from blooming. 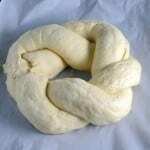 Allow to set until frothy and fragrant, approximately 10-15 minutes. Whisk in scalded milk, melted butter and egg. 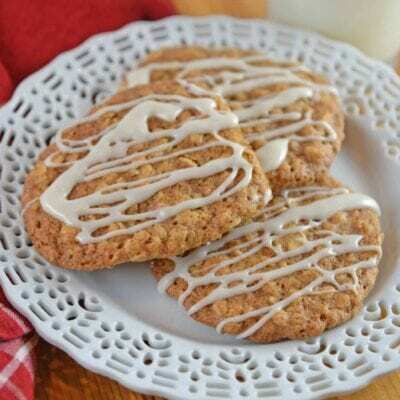 When combined add remaining sugar (1 cup), nutmeg and salt, whisk again. Change attachment to the bread hook (or beaters). Combine flour into wet mixture 1/2 cup at a time. Dough should start to pull away from the sides, if not, add small (1-2 teaspoons) of flour until it does. Knead dough on low-medium speed (or with your hands on a floured surface) for 10 minutes. Lightly grease a large mixing bowl, turning dough over once to evenly oil and prevent from drying. Dampen a tea towel, cover and set in a draft free place. Allow to rise until doubled in size, approximately 2 hours. Meanwhile, in a small bowl, combine all filling ingredients and toss until uniformly damp from melted butter. Turn dough on a lightly floured surface and using a rolling pin, create a rectangle about 18x8 inches. Cut in half length wise with a knife. Spread filling mixture evenly over both sections of dough, leaving a 1/2 inch at each edge. Roll, lengthwise and jelly roll style, into a rope. Carefully, twist together the two ropes and form into a circle, pinch the two ends together to make a wreath. Carefully transfer to a parchment paper lined baking sheet. Cover with damp tea towel and allow to rise for 45 minutes to 1 hour. Preheat oven to 375 degrees. Bake, uncovered, for 30 minutes. 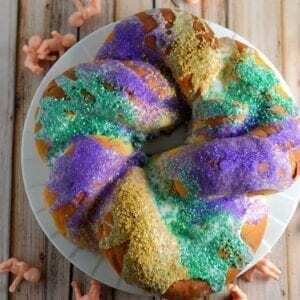 King Cake should be lightly browned. Remove and allow to cool fully. Whisk together glaze ingredients and drizzle over King Cake. Sprinkle alternating gold, purple and green sparkling sugar while glaze is still tacky. loved the flavor. my only complaint is that the cake was very brown at the 18 minute mark when I checked on it. ended up lowering the temp to 350 and covered it with foil the last 12 minutes but the bottom was very tough. I tried this recipe today. Thank you for sharing it. I ended up using the 1 tablespoon in the yeast mixture and 1/4 cup in the cake mixture. I’m not sure if this was correct or not, I was going by similar recipes. 2. The recipe doesn’t state how/where to use the cake portion’s 2 tablespoons of butter. I added it to the wet cake mixture ingredients, because that’s what made the most sense to me at the time. exactly what I was hoping for texture-wise. Cheers and Happy Mardi Gras! Thank you for the feedback! We recently switched recipe templates and it seems some of the instructions were lost in translation. We will clarify. I was nervous about the couple of errors in the recipe (didn’t use the butter in the dough cause I wasn’t sure how to incorporate it) but it turned out GREAT! 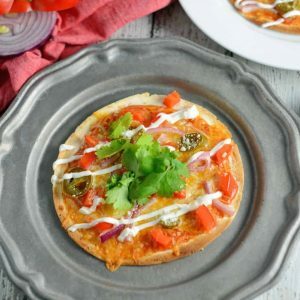 So easy and yummy! I’ll definitely be making it again. It can “moonlight” as a breakfast bread for any occasion.Thanks! Glad it turned out well! All of the errors have been corrected. This is such a fun tradition! I love the story behind it! It totally looks like it’s right my alley taste-wise, as well! Such a gorgeous cake. 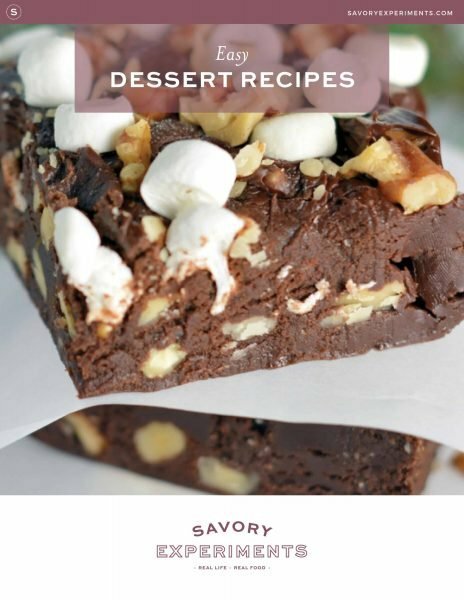 Love all the pretty colors and the cinnamon & pecans sound really yummy in this. This cake looks so festive and beautiful. I never had King Cake before, I look forward to trying some soon. What a beautiful king cake! I have never known until now what the mardis gras colors representated. Thanks for that info and a fabulous recipe! I’ve never had a king cake before. Crazy, right?! 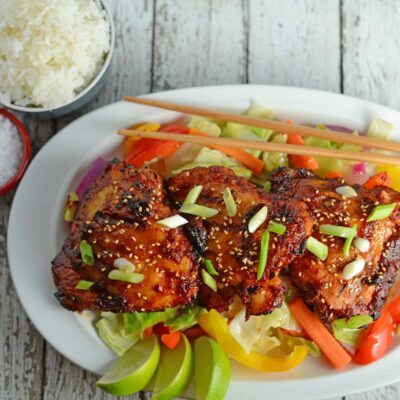 This looks so festive – I have to try it! Great on the inside and great color on the outside. This is so beautiful! 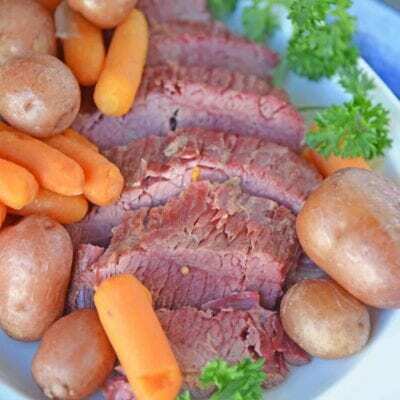 I think I should make this and serve it with Gumbo for a special celebration! Thanks for the recipe.